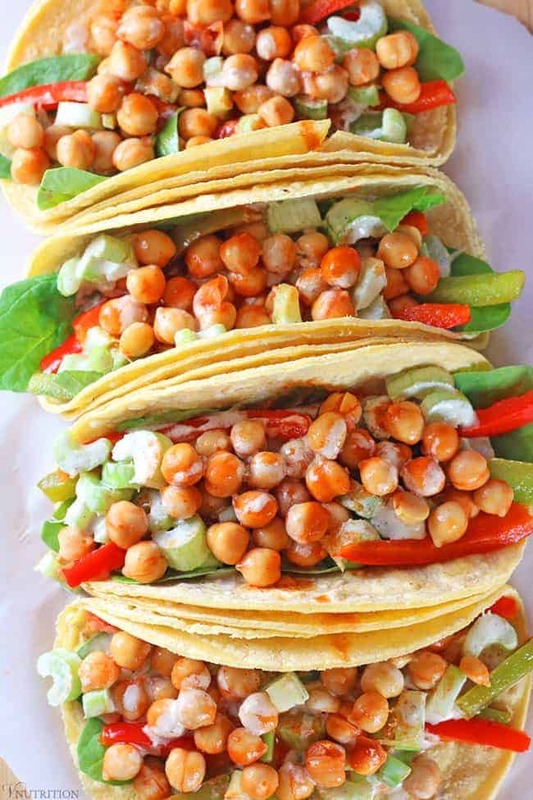 These Buffalo Chickpea Tacos are healthy, delicious, and easy to make. They have just the right amount of “kick” for those buffalo sauce lovers in your life! Buffalo anything is my jam. I have made some Buffalo Quinoa Balls and a Vegan Buffalo Chick’n Skillet for the blog already and I have a few other ideas up my sleeve to share soon. When I was asked to review Vegan Richa’s Everyday Kitchen and share a recipe, I jumped at the chance to do something else buffalo! I’ve been reading Richa Hingle’s blog for a long time now. I love how she infused spices and Indian flavors into her everyday cooking. All of the recipes I’ve tried from her are delicious. 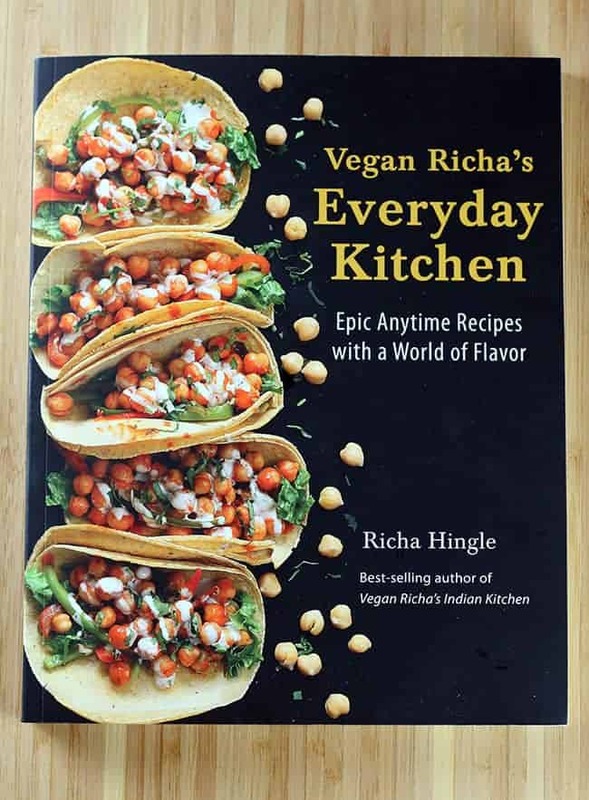 Vegan Richa’s Everyday Kitchen is an extension of Richa’s fabulous blog. The flavors are rich and the recipes are fun and inviting. My favorite part of any recipe is the sauce (what can I say, I’m a saucy lady) so I was really excited to see Richa have so many “awesome sauces” to mix and match with different foods. For instance, her Kung Pao Sauce is used for her Kung Pao Lentils, Kung Pao Tofu, and Crispy Kung Pao Cauliflower – yum! 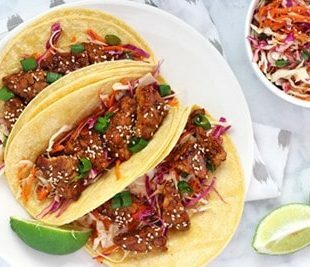 Recipe Pictures – What I Want! What really stood out for me are all the beautiful pictures. Just about every recipe in this book has a picture to go along with it which I totally love. How do you know if you want to try a recipe if you don’t know what it looks like? Luckily, Richa understands and gives us what we want! 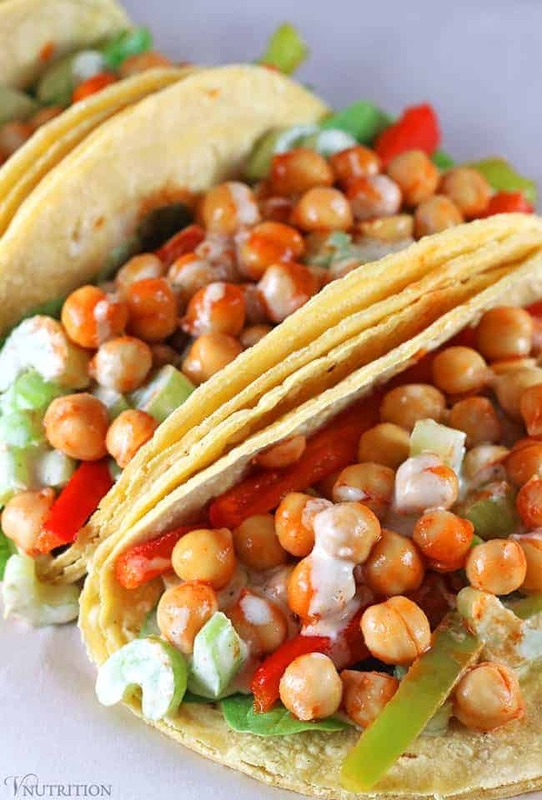 These Buffalo Chickpea Tacos were really easy to make. There isn’t much cooking involved except for sauteeing the peppers. Altogether this recipe took less than 30 minutes to get on the table. You could even make the celery ranch dressing the day before and make it in even less time. I made a double batch of the chickpeas and veggies for my photoshoot and I’m really glad I did. I used the leftovers for a tasty salad for lunch the rest of the week. In a blender, combine the cashews, milk, salt, oil, pepper, garlic powder, onion powder, nutritional yeast, vinegar, parsley, thyme, and dill. Blend until smooth and creamy. Taste and adjust the seasonings. Add the chives (if using) and stir gently to combine. Combine the hot sauce, sriracha, olive oil, and vinegar (if using) in a medium bowl. Add the chickpeas, tossing to coat them in the sauce, and set aside. In another medium bowl, combine half the celery ranch sauce with the celery. In a third medium bowl, thin the other half of the celery ranch sauce with water if needed. Heat the safflower oil in a large skillet over medium-high heat. Add the green bell pepper, red bell pepper, and 1/4 teaspoon of the salt. Cook the bell peppers until they are golden on some sides, 4 to 5 minutes, stirring occasionally. Warm the tortillas if desired. 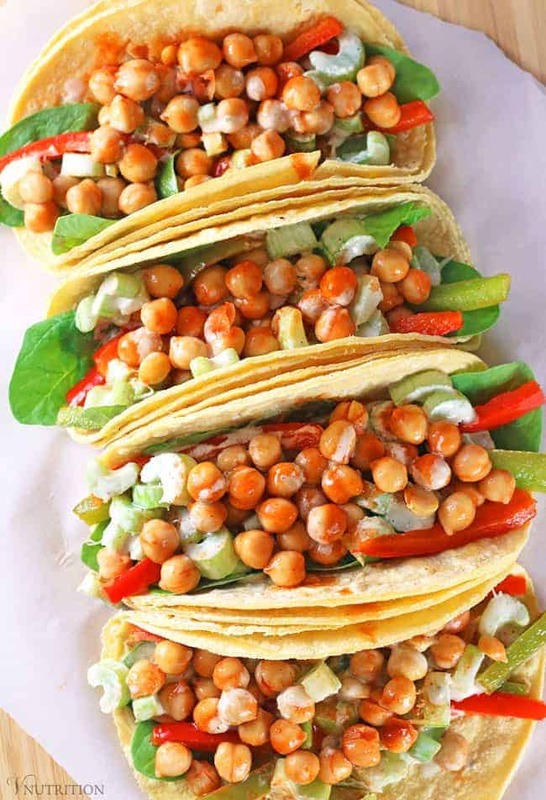 Add some of the baby spinach, roasted bell peppers, and celery to every taco. 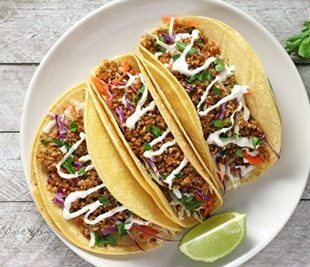 Divide the remaining 1/4 teaspoon salt between all the tacos. 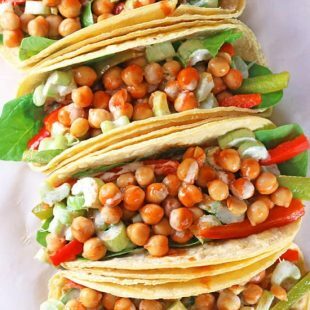 Add some Buffalo chickpeas and a generous drizzle of the celery ranch sauce to each taco and serve. 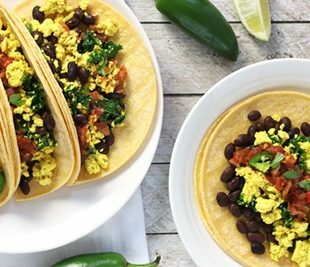 This recipe looks amazing and I can’t wait to try it because my hubby is a huge taco fan. Thanks for the giveaway opportunity! I love this recipe! I’ve made it twice now! I’m looking forward to trying others in the book – including the buffalo chickpea pizza! I need to try that pizza!! Thank you for the opportunity for the giveaway! I’ve been wanting this book for a long time! 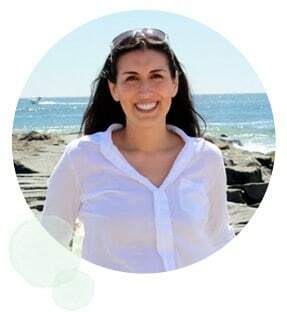 Vegan Richa ROCKS!!! Peanut sauce is my favorite! Oooh yes, peanut sauce is so good! I like hot sauce and tahini sauce, depending on the meal. Yes, those are both so tasty Karen! I use them a lot as well. Yes! I’m all about the cashew cheese sauces too, Bria! Chickpeas are my favorite beans! Lydia, that’s actually a really good idea. I may have to test that out soon. I’d love that too! Peanut sauce is definitely one of my favorites! Me too Corrine, it’s really versatile! Pesto is my absolute favorites, but peanut sauce is right up there, too!! I have really been into Tabasco sauce lately- even on fruit! I love tabasco but never tried it on fruit…I may have to now! This looks like such a fresh, vibrant and full-flavoured meal! Did I read that correctly? A whole chapter on buffalo sauce?! Yes!! Buffalo or hot saucey recipes – so fun! I’ll eat anything with spicy peanut sauce on it.